Police said Friday morning that a woman who claimed a stranger slashed her in the face made the whole story up. The 20-year-old woman had previously said that she was walking on a lower Manhattan sidewalk Thursday when she was slashed in the face by stranger who called her a "terrorist." But by the end of the day, she told police that she slashed her own cheek, leaving a two-inch gash on the left side of her face. She was taken to Bellevue Hospital for a psychiatric evaluation Thursday night. 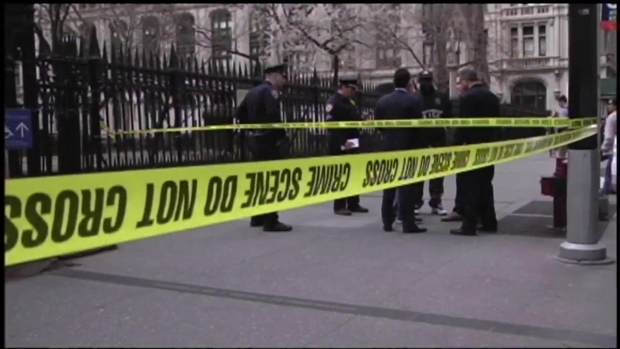 A woman walking on a lower Manhattan sidewalk was slashed in the face by a stranger who allegedly called her a "terrorist," police say. John Chandler reports. She will not face charges, according to NYPD Chief of Detectives Robert Boyce. The woman originally said she was walking in front of 65 Broadway near Rector Street shortly after 5 p.m. when a man slashed her on the cheek. The FDNY said EMS treated the woman at the scene before she was taken to Bellevue Hospital. A police official at the scene said the woman, who was wearing a head scarf, told officers that a man approached her and called her a terrorist, then slashed her before fleeing.